"Good Morning, Gardeners!" is the cheery Sunday morning greeting familiar to over half a million radio listeners across the USA. Paul has hosted The Paul Parent Garden Club every Sunday morning for the last twenty-seven years. The Paul Parent Garden Club focuses on accurate and up to date information for the beginning to advanced gardener. 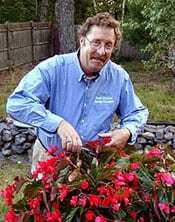 Paul's common-sense gardening information helps you ensure a successful gardening project. Paul hails originally from Auburn, Maine. Sharing a happy home with four siblings, Paul has had his own garden for as long as he can remember. His family moved from Maine to Scituate, Massachusetts, when Paul was 13. Graduating from Scituate High in 1967, with an eye toward a career in horticulture, Paul enrolled in Stockbridge School of Agriculture, University of Massachusetts. He spent his academic time in Stockbridge totally immersed in floriculture, landscaping, and turf management studies and graduated with degrees in Floriculture and Landscaping. Married in 1972, Paul, and his wife Chris have raised three sons, Matthew, Jason, and Patrick. In addition to his already busy schedule of running a business, hosting a radio show, and being a loving husband and dad, Paul and his wife Chris are popular travel tour hosts. Son Patrick takes over for Paul when he takes his listeners on tours. Paul and his family reside in Kennebunk, ME.